Not sure where to start as I am still truthfully speechless at how amazingly perfect our wedding went. 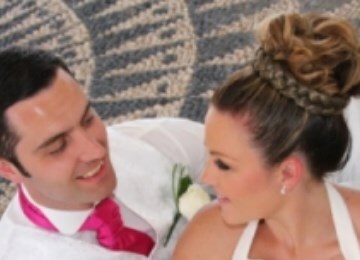 I cannot thank you Tracy enough for organising our perfect day and Justine for putting it all together. It was 1 million times better than we could ever have imagined. When we arrived at the Taverna with Justine on the Sunday morning we thought it was stunning & was even more excited about the wedding but it really really was amazing on the actual day. The food was fab (only complaints we got was that there was too much and they literally couldn't eat it all and they wanted to as it was beautiful)!! The flowers were simply stunning and the archway and little touches like the cake knives and "Mr & Mrs" sign were lovely and made the whole place that little bit more special looking. Justine & Michelle were amazing on the day and a pleasure to share the short time they spent with us. Just want to say a massive thank you to Tracy and Justine!! You were both amazing in making our day run so smoothly and making it wonderful. Nothing seemed too much for either of you before the wedding, on the day and after. I don't think the day would have worked out like it did without you. I thank you again for making our day one of the best days of our lives, and for all future brides to be you will not be disappointed!! I would like to thank yourself, Tracey, Michelle & Audrey for making our wedding day so very special. Tracy was a star over in the uk answering all my questions during what seemed a very long 20 months. Then yourself and Michelle settling my nerves at our consultation meeting on arrival in Rhodes... I can honestly say that from that meeting onward until our wedding day i didnt worry once, you had it all taken care of!! Our day was fabulous and I really believe it couldn't have been better... St Paul's was stunning and afterwards we saw in the evening with a wonderful meal at "Philosophia" which was truely amazing. Barbara and Philip couldnt have given us a more beautiful setting and the food and service were second to none. Thank you again for giving us a day we shall never forget... we are now counting down the days to when we return for our first anniversary. 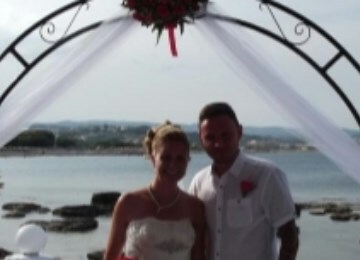 I booked our reception through Unforgettable Rhodes for our wedding on 29th July 2013 at quite short notice. From the first email enquiry Tracy was extremely helpful. 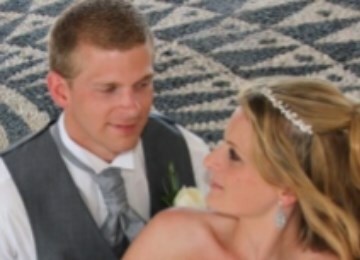 Everything was sorted so quickly and efficiently and Tracy had amazing attention to every little detail (even things I hadn't thought of) I met Justine when I arrived in Rhodes and she was excellent in reassuring that everything would be fantastic and it was for my 41 guests. We had the reception at Tsampikos restaurant and couldn't have wished for better the place was stunning and food delicious. Big Thank you to Michelle as well for her fab table decorating our guests were amazed. I'm just so sad it's all over but have fantastic pictures and memories to keep forever. We would like to extend our thanks to you and your team for making our wedding everything we could of imagined and more. From guiding us to reassuring us with concerns we had, your team were fantastic to have on our side and we always felt you would come to the rescue no matter what. The day went exactly as planned without a single issue. Our family and friends had the most amazing experience and haven't stopped talking about it since. We all wish we could go back and do it all again! Thanks for helping to make some fantastic memories of a brilliant wedding. Firstly I would like to thank you for such a perfect day. Tracy for answering all of my endless questions beforehand and Justine for being so thorough and helpful whilst we were in Rhodes and especially on our wedding day. The spa was much more beautiful than I thought it would be and Tsambikos for the absolutely stunning food and very friendly and helpful staff (they kept the bar and music going until we were ready to leave which was about 2am). I would not have changed anything of our day as every little detail was perfect thanks to all your help. I would also like to say a big thank you to Samina. Everyone was telling me how perfect my hair and make up were, which was all down to her. 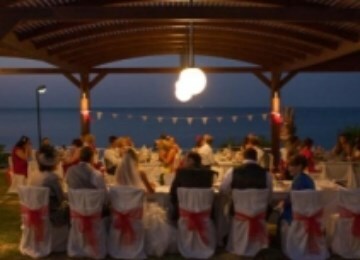 I would definitely recommend Unforgettable Rhodes wedding to anyone who is thinking about booking with them. They are all very professional but also very personal and caring to your needs and wishes. Thank you all again for making our day so special.